Back then, it was just some software at an expensive price, but I was able to try it out at CES. The Intel booth had a couple of computers running this software, so I was able to spend a few minutes with it. This software includes sensors that attach to your fingers. 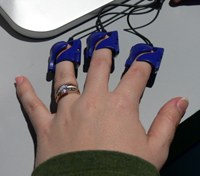 You control the environment in the â€œgameâ€ with the biometric sensors. You also interact with the software using your mouse. There is an introduction with the â€œgardenerâ€ of the area that introduces the concepts to you and tells you what youâ€™re supposed to do at each level. She spoke very calmly and I found her voice to be as soothing as the new age music playing in the background. 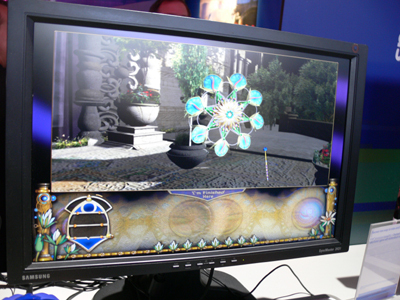 The first level consisted of a pinwheel that was supposed to rotate when I took a deep breath. It would move, I would get excited about it moving and it would stop. The only way I could consistently make it move was if I talked to Mike about it. I guess Iâ€™m calmest when talking. How very apt. The noisy Las Vegas Convention Center is the worst place on the planet to test meditation software. The few people who were willing to try the Journey to the Wild Divine were as equally unable to make the pinwheel move as I was. Ironically, I really liked the â€œgame.â€ The music in the background had a New Age feel and was relaxing. 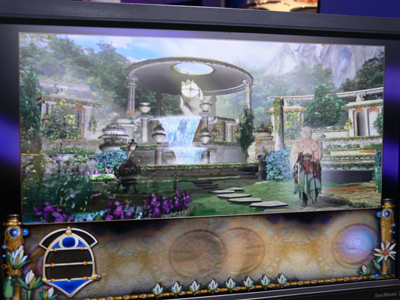 The â€œgardenerâ€ had a calm voice and was very clear about the objectives of the level. I donâ€™t know if itâ€™s worth the hefty price tag ($159.95). It depends on how much you are unable to relax on your own. For me, struggling with normal meditation felt about the same as struggling with the biofeedback. Since meditation is free, Iâ€™d have to choose that one. Additionally, if you would like to listen to the music that is featured on the game, they sell the Wild Divine Soundtrack. You could purchase that and meditate with it for only fifteen bucks. Those who have not moved past the pinwheel have to learn to control their breathing. Yoga breathing exercizes are the best way to learn to control the breath. The game not only requires a calm, meditative energy to master the taks presented, one must also learn to increase their personal energy through thoughts, laughing. The color of the eyes that appear on the screen will let you know if you need to increase your energy flow or decrease it. If you can’t get the pinwheel to move, move on. The game is designed for both experienced and inexperienced biofeedback adventurers. As you learn you will gain the necessary biofeedback skills to master each level, so don’t give up so easily! It isn’t for amusement or quick results. It is the opposite of instant gratification…it teaches that with patience and application, controlling your energy level is do-able, all the time. The skills you learn in this game will benefit your health throughout your day, in times of stress or discomfort. It’s worth the work! The graphics are awesome and beautiful. I have found an hour of yoga feels like 8 hours sleep. An hour of the Wild Divine feels like a weekend retreat! Indulge yourself. You will be delighted at the results.